Layering up in style | Outfits - Do You Speak Gossip?Do You Speak Gossip? These photos were taken on a really, REALLY cold day, when I had an event to attend and wanted to be stylish, but I was trying to stay as warm as possible. My long knit scarf was the first thing that came to mind, to protect me from the evil wind of that day. A midi dress was chosen for the style factor (with a bodysuit inside of course), opaque tights, tall boots (to leave only the slightest of skin exposed), cropped jacket to create a “suit” look, and my longest coat, on top of all to keep me protected. It was going to be a long, long day… And my outfit of choice did not disappoint me. Well, what do you know? You can indeed look stylish AND warm at the same time. I was surprised too, believe me! What do you think? Do you wear lots of layers to keep you warm during winter? 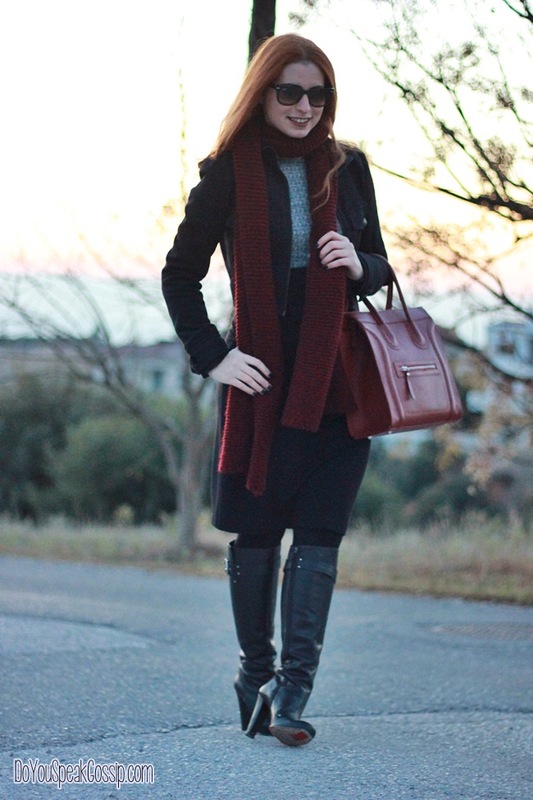 Do you struggle to find a warm AND stylish outfit too? Και κομψή και στυλάτη και ζεστή! Πολύ μου άρεσε και ο χρωματικός συνδυασμός που έκανες! Συμφωνώ και επαυξάνω με την επιλογή σου! (Είχε κολλήσει ο υπολογιστής μου και είχε μείνει μια χιονονιφάδα πάνω στα γυαλιά σου -στο ένα τζάμι!- και είχα την απορία γιατί δεν τελείωσες με την επεξεργασία της φωτογραφίας και στο άλλο τζάμι!!!) Αυτός ήταν ο εξευτελισμός μου για σήμερα!!! S’eyxaristw poli Joanna mou! Auto to kaskol einai oti pio zesto exw..Itan oti prepei gia ti mera! I think this must be one of my top 10 outfits that you have worn till now! You know I love winter and I really love to think of winter outfits! You look very elegant, very warm as well 🙂 I love burgundy and high knee boots, plus black as well – so, the outfit is, in my opinion, really perfect! You look elegant AND gorgeous! Makia! Really? Oh wow! Thank you! 🙂 I was trying really hard to keep myself as warm as possible and you know how difficult it is to combine this with the word stylish. hehe I always feel like a ball of clothes when I’m trying to layer my clothes to feel warm during winter. And you know I’m the opposite…I hate winter, because of the cold. I prefer Spring and then Autumn. hehe We’re different in this. But it’s ok! Makia! Markela mou!!! Eisai poli kompsi kai zesti, to Black & burgundy sindiasmos einai idanikos. To palto, oi mpotes kai to kaskol einai accessoir aparaitita sto KRIO xeimonas! Edo stn Xio kanei poli pio krio se sxesi me tin Kriti pou emeina!!!! S’euxaristw poli Vanda mou! Ontws aparaitita me to krio pou eixe ekeini ti mera! Fantazomai oti i diafora thermokrasias Xiou kai Kritis tha einai tromeri…Exw paei kai sta dio nisia kai katalavainw ti ennoeis…I Xios exei kai poli aera san ti Thessaloniki…Distixws emeis exoume kai polli igrasia, kai otan vgainei Vardaris den antexetai me tipota…Opws ekeini ti mera! Megeia to neo sou mpoufan! Einai poli wraio! Flawlessly layered! Love that super long over coat, is so elegant! And them boots, those are to die for! Ennoeitai oti tha tin evaza ekeini ti fwtografia..Afou tairiaxa epitides ton pato tis mpotas me to kaskol. xixixi S’euxaristw poli gia tis fwtografies kai gia ta kala sou logia! Ontws kai egw otan tis epexergazomoun, eniwtha to krio ekeinis tis meras kai pagwna! Thank you very much Sarah-Jane! You’re absolutely right! I hate winter too, not only for the cold but also for the reason you mentioned! Η τσαντα με το κασκόλ δένουν τόσο ωραια! wraia xrwmata! latreuw borntw! kai to palto teleio! Caterina Drak recently posted..designer. Gianvito Rossi. Love her outfit. Look so pretty and gorgeous. Junalin recently posted..Is A Doula Right For Me? A very stylish way to layer! Και εσύ είσαι σκέτη κούκλα!! Pingback: B&W city look | Outfits | Do You Speak Gossip? Que monada de bolso, queremos uno ya!!!! Pingback: My month in pics | December 2013 | Do You Speak Gossip?